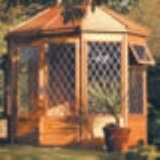 The Malvern Gazebo summerhouse is the most popular summerhouse from the Malvern range. 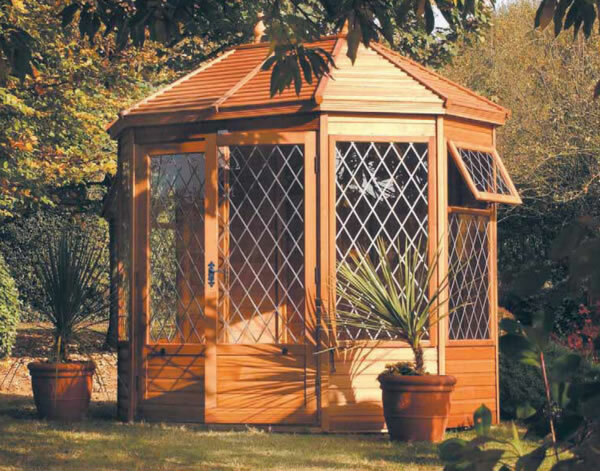 An Octagonal summerhouse in shape and available in a range of sizes from 6'x6' up to 10'x10'. Each size is also available in a pressure treated version. This is a very high quality building with antique style hinges, long leaded windows and doors. Options available on this gazebo include Georgian style beamed windows and doors, optional cladding of deal or Cedar. Also available is a cedar slatted roof.